With tonight’s setting sun comes Passover. A friend explains it best: “We are traveling through the desert with our ancestors via a table filled with metaphor and symbolism.” This moveable springtime holiday in the Jewish calendar commemorates the liberation of the Israelites from their slavery in Egypt. The celebration of Passover (or Pesach in Hebrew) is a meal, the seder. Unleavened bread is a central part of the celebration, for the Israelites had to leave Egypt so quickly there was no time to let the bread rise. Instead, it had to be baked immediately. There is traditionally a place at the table reserved for Elijah, the prophet, and the words “Next year in Jerusalem” are a common refrain. At the table is a book, the Haggadah, which tells the Passover story. Those gathered around the table read from the book in the midst of the seder plate, filled with foods rich with symbolic meaning. They say you can’t celebrate the holiday without a haroseth, which is a mixture of chopped nuts and apples, wine, and spices. It sounds like a celebratory part of an autumnal meal, but it is here in the springtime, symbolic of the mortar used by the Israelites when they were slaves in Egypt. Family and food, rich in meaning, celebrated since time immemorial: these are the roots of Pesach, a festival of freedom. 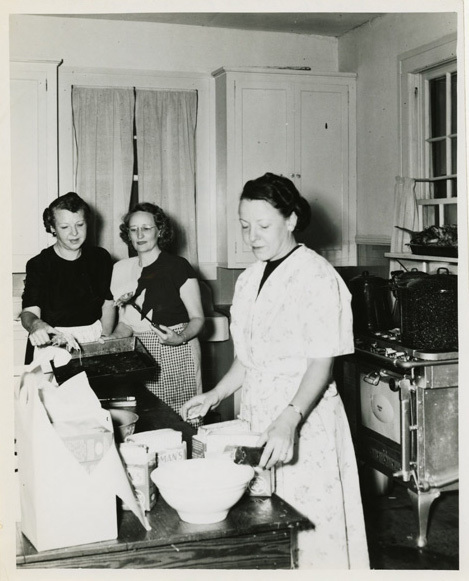 Image: Preparing for the Seder in the Kitchen of the Community House, Biloxi, Miss., April 13, 1949. Digitized by the Gruss Lipper Digital Laboratory at the Center for Jewish History.